Sewage contamination can be very dangerous; as well as the obvious problem of being smelly and unpleasant, it can also pose serious health concerns for the inhabitants of the house. The specialist property management company Hamilton King explains the causes of sewage contamination and how to deal with it safely. Hamilton King also has a CompaniesintheUK page which it uses as a platform to provide more information about their business in an open way. Sometimes a sewer will back up because it has been blocked; usually because something inappropriate has been introduced to it. This might be something solid which is too big to pass down the pipes, or it might be an accumulation of items over time. For example, fat might be poured down the sink which is liquid because it is hot; once it has cooled down, it will solidify and begin to obstruct the pipes. Also, hair which has been flushed down the plug hole will also build up until it will eventually reach the point of blocking the pipes. The sewage service line can develop structural issues such as holes, cracks and pipe collapses. There might also be problems with the pipes moving so that they no longer line up correctly, or the joints may deteriorate so that they are no longer water tight. 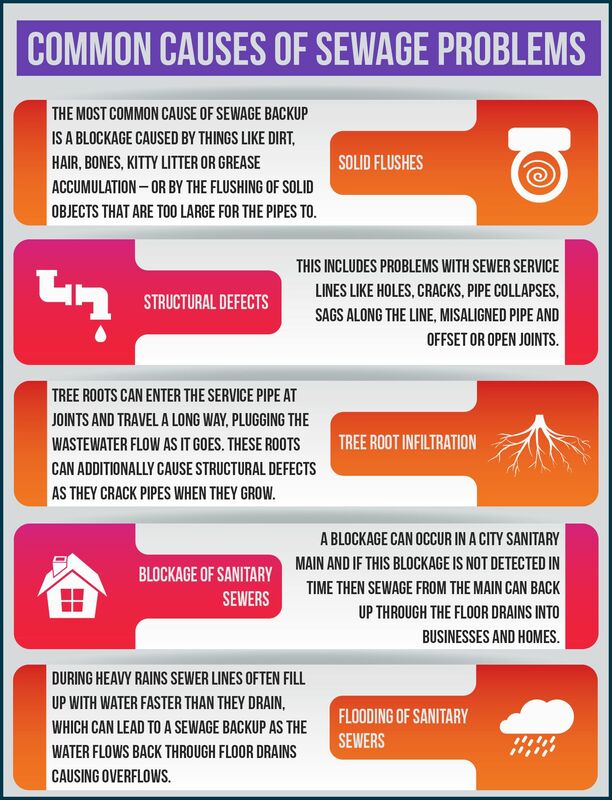 Tree roots are a well-known cause of damage; roots in sewers are the third greatest cause of sewer repairs, behind blockages caused by fat and structural problems with the sewer. As they are very persistent, they will eventually make their way into the sewer. A sewer has everything that a tree needs – they are a source of water, nutrients and oxygen which enables them to flourish. Sometimes the main sewer will either become blocked or flooded, and if this happens, sewage from the main pipe can back up and emerge into businesses and domestic properties through floor drains. Why Is Sewage Contamination So Dangerous? Sewage water isn’t just dirty; it also contains many biohazards which pose a threat to humans as they can be transmitted through skin contact and through breathing them in. Many different types of bacteria can be found in sewage, which produce a variety of unpleasant symptoms including abdominal cramping and diarrhoea, eye, ear, nose and throat infections, liver infection and failure. In extreme circumstances they can be fatal. It is also likely that parasites may be present, which can cause abdominal cramps, diarrhoea, sickness and weight loss. Being exposed to sewage can cause a multitude of other health problems, including hepatitis, tetanus, Legionnaires ’ disease, allergic alveolitis (inflammation of the lungs) and skin infections. If there is a problem with the sewer, you may notice that waste water is not leaving your property properly. There may be a blockage if it is difficult to flush your toilet, the sink or bath empty more slowly than usual, and a bad smell is coming from the drains. When waste water is being blocked, it may come back up from the sink or from the toilet, which could potentially cause a flood. What Should You Do About Sewage Contamination? It is a serious problem which requires professional attention in order to restore the building to a safe and useable condition. After a sewage disaster, it is urgent that the property should be cleaned and repaired and the affected area must be thoroughly cleaned and disinfected to remove the potential for health problems. Any items which have come into contact with the sewage are unlikely to be salvageable. Soft, porous things such as mattresses, pillows and paper products should probably be thrown away as it is unlikely that they will be able to be decontaminated properly. The only items that might be able to be saved are those which can be thoroughly cleaned by a process which uses hot water and specialist cleaning chemicals. Usually when cleaning up sewage disasters, the flooring and carpeting in the affected rooms must be removed, together with any contaminated objects. Then a disinfection process can be started using specialised cleaning solutions which are designed to kill bacteria as well as disinfecting rooms which have suffered from sewage ingress. Do not pour cooking fat which is solid at room temperature down the sink. Instead, pour it into a container, allow it to harden and put it in the bin. Be careful of what you flush. Feminine hygiene items and facial wipes should be put in the bin, even if the packaging states that they are flushable. Avoid planting trees near to sewer lines. Consider installing a backwater prevention valve. This will allow waste water to leave your property to join the main sewer but will not allow it to travel the other way, so that if the main sewer is blocked and backs up, your property will not be flooded. With a little bit of care, you might never need to face the problem of sewage clean-up.